It’s so easy to ignore small misbehavior – a child who “doesn’t hear” you calling him or students quietly whispering during a lesson. It’s no big deal, we think as we move on with our day. We have bigger things to worry about. But unfortunately, if we ignore small problems they quickly become big problems. This definitely happened to me my first year of teaching. I let a lot of little things go because I just didn’t think they were that big of a deal and I didn’t want to hand out punishments for tiny infractions. But once students saw that I wasn’t going to correct them for whispering, they just started talking whenever they wanted. And when I didn’t correct one student for shouting out an answer, soon everyone was just shouting out responses. It wasn’t long before chaos ensued and I was dealing with bigger and bigger issues. And once students are used to acting this way, it’s quite challenging to reign them back in. Even in my fledgling efforts at parenting my one-year-old, I’ve seen this principle at work. I didn’t think it mattered that he was dropping food from his high chair – until he started doing it all the time with messier and messier foods. Now of course, this really isn’t the end of the world, but it’s taking a lot more time to retrain him than if I would’ve been consistent from the start. Whether it’s classroom management or manners training or more important matters of character and the heart, it’s way better to deal with the problems before they’re problems. Because small problems don’t stay small. It’s just a fact – if we allow small issues to go uncorrected, they will happen more and more often and grow into bigger and bigger problems. Because if you don’t deal with them now, you’ll have to deal with them later. Sometimes we figure we just don’t have time to deal with something so small right now, but we can’t kid ourselves. 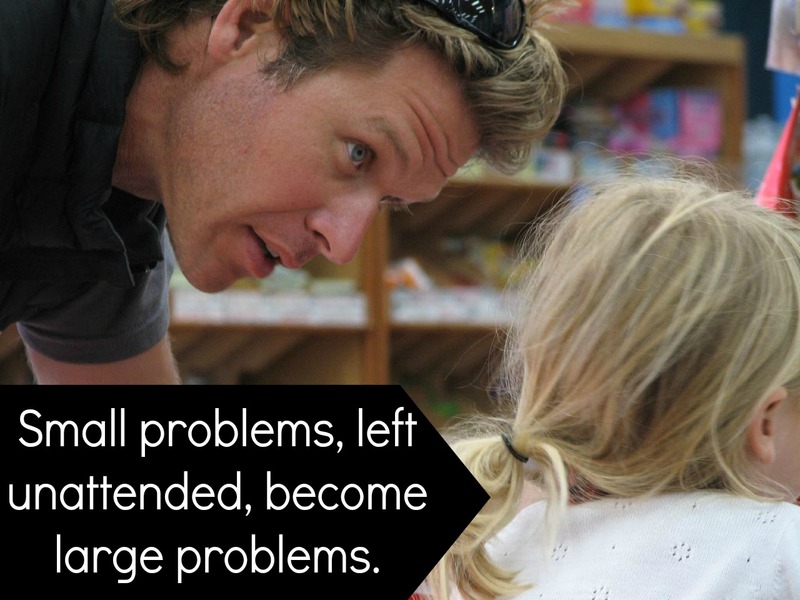 If we don’t deal with the small problem now, we’re just going to have to deal with a bigger problem later on. And it’s not like we’re going to have more time then. Because it takes longer to retrain than to train. Nipping a problem in the bud may take some time and energy, but not nearly as much as it will to retrain a child or student after you’ve allowed them to develop a bad habit. Because you can deal with small problems kindly. Sometimes we don’t want to address a small issue because we think we have to give out a punishment. That’s just not the case. Sometimes a simple redirection or an explanation of what behavior is proper is all that’s needed. The child or student just needs to see that the behavior is not acceptable and will not be permitted. Because kids thrive on consistency. The more consistent we are, the better. Kids understand and appreciate consistency because they know exactly what is expected of them. If today a little backtalk is ignored but tomorrow they get grounded for it, they will be confused and frustrated, and our efforts to instill good habits and character will be hindered. The more consistent we can be on the front end, the quicker kids will learn the lessons we want to teach them. What situations have you experienced in which you saw this principle at work? Share your thoughts by leaving a comment below.